What is the problem? There are a number of questions about how broadband internet providers should be regulated. U.S. consumers appear to pay more for slower internet access than European consumers partially because of a lack of regulation, and regulators are currently deciding whether and how to implement “network neutrality” rules that would prevent providers from discriminating between different types of traffic. What are possible interventions? The Federal Communications Commission (FCC) appears to have the authority to implement regulations to enforce network neutrality and open access to broadband networks. A funder could support a variety of advocacy or research efforts to encourage effective regulations. Who else is working on it? A number of nonprofits and major technology companies are advocating for the FCC to adopt regulations requiring network neutrality, and a smaller set of groups are advocating for regulation to address cost issues. Because broadband is a natural monopoly, it is plausible that a lack of regulation might lead to poor service and high prices.3 The Federal Communications Commission (FCC) does not publish enough data on broadband pricing to estimate a mean price paid by all American consumers, but estimates by the New America Foundation’s Open Technology Institute suggest that U.S. broadband subscribers pay roughly $15/month more than European broadband subscribers, though with significant variability.4 Under the somewhat heroic assumption that these costs are accurately estimated,5 reaching cost parity with Europe (which may not be possible) would shift around $15 billion/year from broadband companies to consumers.6 It is difficult to estimate the deadweight loss from natural monopoly pricing, and we have not seen any estimates of those costs for broadband services in the U.S. The FCC could propose some other form of network neutrality regulation. A funder interested in promoting any of these policies might support advocacy or research organizations working in the field. We do not have a sense of which advocacy activities might be most helpful or how cost-effective they might be. Consumer protection groups, including the Consumers Union and the Consumer Federation of America. Groups focused on social justice in the media, such as the National Hispanic Media Coalition and the Media Action Grassroots Network. Foundations, including the Ford Foundation and the Knight Foundation. Former FCC commissioner Michael Copps, who now serves as Special Advisor to the Media and Democracy Reform Initiative at Common Cause. How likely and how harmful are network neutrality abuses likely to be in the absence of regulation? What degree of resources are for-profit and non-profit advocates for net neutrality and open access policies (which are designed to increase competition and reduce costs) devoting to the issue? Are there important gaps in the advocacy infrastructure on either issue? What does the landscape for municipal broadband efforts look like? What are the benefits and costs of open access municipal networks? We rely heavily on a conversation with Patrick Lucey and Danielle Kehl of the New America Foundation’s Open Technology Institute. 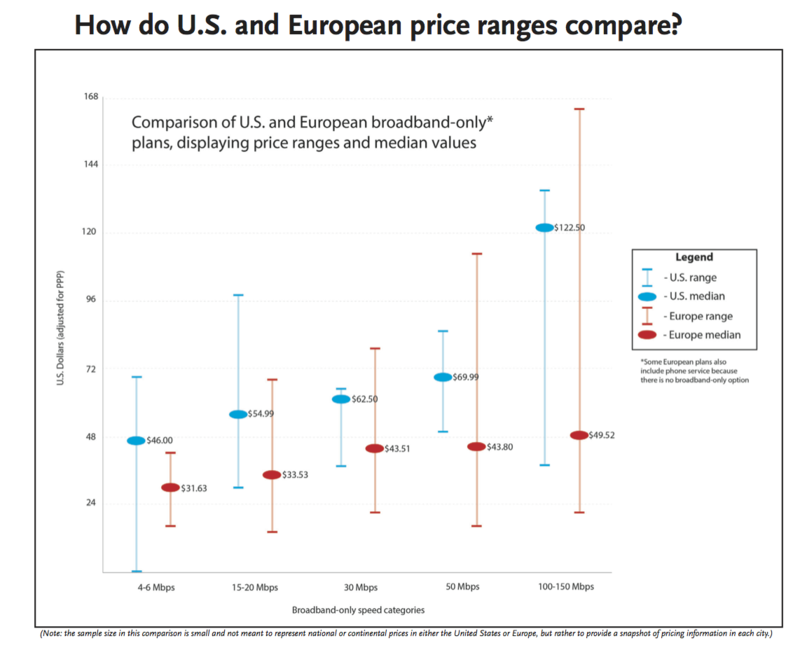 “Compared to consumers in other countries, Americans generally pay more for broadband internet, with smaller differences for lower speed plans and larger differences for higher speed plans, particularly those from large incumbent providers. Exceptions to this trend include high-speed plans provided over municipal broadband networks and Google Fiber. Leichtman Research Group 2014 estimates that there are roughly 90 million broadband subscribers in the U.S.: “Leichtman Research Group, Inc. (LRG) found that the seventeen largest cable and telephone providers in the US – representing about 93% of the market – acquired over 2.6 million net additional high-speed Internet subscribers in 2013. Annual net broadband additions in 2013 were 95% of the total in 2012. These top broadband providers now account for 84.3 million subscribers – with cable companies having 49.3 million broadband subscribers, and telephone companies having 35.0 million subscribers.” If there are 84.3 million broadband subscribers in ~93% of the market, the total number of broadband subscribers is expected to be roughly 90 million. 90 million subscribers times $15/month times 12 months/year = $16.2 billion/year. “Generally speaking, network neutrality violations have been rare, but a few controversies have occurred over the last decade…. In 2007, Comcast interfered with users’ peer-to-peer file sharing applications by sending fake reset packets that tricked each side of the connection into believing the other had hung up. When the FCC tried to punish Comcast for the infraction in 2008, the cable company sued, arguing that the FCC needed to go through a formal rule-making process before net neutrality rules could be legally binding. The court sided with Comcast in 2010. “Generally speaking, U.S. regulation gives internet providers exclusive control over their infrastructure. Because building infrastructure is prohibitively expensive, this limits competition. In most other developed countries, open access provisions (such as local loop unbundling) let competitors provide services over networks owned by other companies at regulated rates. Open access was a historic principle in the U.S. that we’ve moved away from (in part because of issues about how broadband is classified). Some argue that one of the corollary benefits of Title II reclassification would be allowing the FCC to reinstitute open access provisions, which would spur competition…. Telecommunications services, which are classified as common carriers and subject to requirements that include open access provisions. Common carrier requirements prohibit discrimination. Information services, which are not classified as common carriers and are not subject to open access provisions. Broadband is currently classified as an information service. Strengthen net neutrality by giving the Federal Communications Commission (FCC) the authority to regulate broadband providers as common carriers. Help settle details regarding the business structure of open-access networks. Make it easier for the Universal Service Fund (USF) to provide direct support for broadband access. Removing barriers to infrastructure investment, particularly in the nineteen states that currently limit or ban municipalities from building local networks. The FCC is actively discussing this option. Companies and consumers interested in more affordable broadband services. Public interest groups, including Free Press, Public Knowledge, the Center for Democracy and Technology, and the Electronic Frontier Foundation. Groups focused on social justice for particular constituencies, such as the National Hispanic Media Coalition and the Media Action Grassroots Network. Foundations, including the Benton Foundation, the Ford Foundation, and the Knight Foundation, which runs the Knight News Challenge. “Going back to 2005 (when the phrase “net neutrality” first shows up in lobbying disclosure reports) the biggest opponents of net neutrality (Verizon, AT&T, Comcast and their allies) have lobbied against net neutrality about three times as hard as the biggest proponents of neutrality (Level 3, Google, Microsoft and their allies)…. When we arrange the top 20 net neutrality lobbying organizations by amount of reports on the issue (Figure 1), the disparity is clear. The five most active organizations on the issue since 2005 – Verizon, AT&T, Comcast, the National Cable and Telecommunications Association and the National Music Publishers Association – are all opposed to neutrality. Verizon and AT&T are heads and shoulders above everyone else, with an estimated 119 reports mentioning net neutrality each.